$15,909.99 set of 4 List: $29,418.00, You Save: $13,508.01! 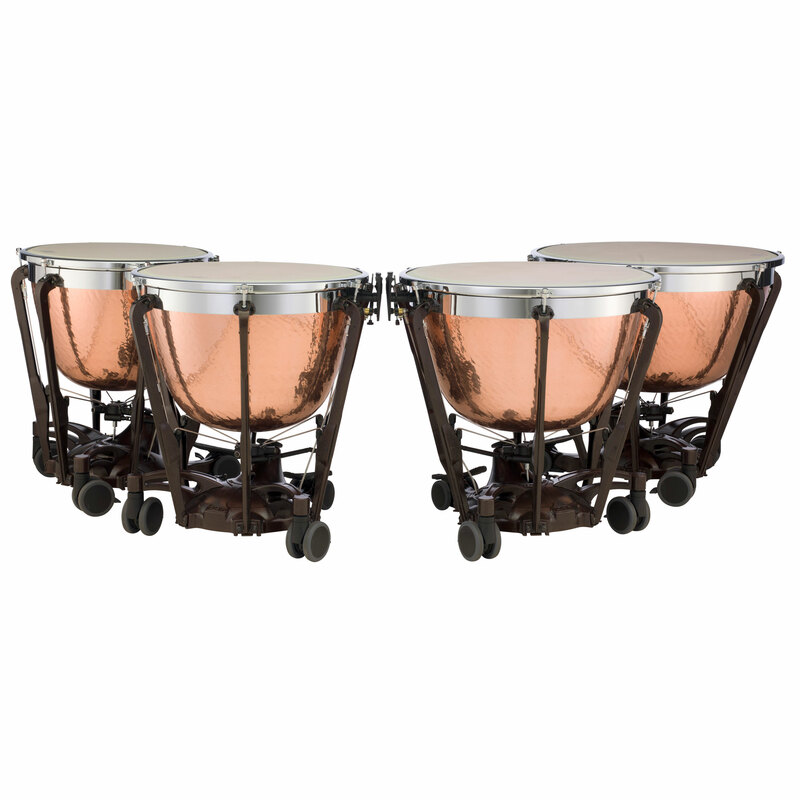 The 23"/26"/29"/32" Set of Adams Professional Generation II Hammered Cambered Copper Timpani brings a professional-level sound to school music programs and budget-minded timpanists. Made of resonant, dark copper, the cambered bowls have a hyperbolic shape that creates a darker tone than a parabolic bowl, with a more focused fundamental tone. This set of four drums will work beautifully on 95% of the repertoire out there for band and orchestra. The sizes of these drums are very standard as they cover a very wide range without sacrificing good tonality. Only very highest notes (around middle C) will sound a bit thin without the 20" drum. When you hit the drums, the hammered bowl causes the interior sound waves to bounce around inside much more actively than a smooth bowl, further enhancing the richness and depth of each note. These drums use balanced action pedals with adjustable spring tension, giving you a smooth pedal feel and a tuning range beyond normal parameters. Tuning gauges make it far easier to tell what note will sound when you hit the drum - as long as you set them correctly before you play! The bowls themselves are suspended from single-flanged chrome-plated steel rings that are supported by thick struts. This particular design provides you with a huge amount of power and a very long amount of sustain. Large commercial-grade swivel casters and wide base legs make it incredibly easy and safe to move these drums. The third set of casters under the pedal makes transportation a simple process that doesn't involve bending over, and firmly lock into place when it's time to play. The balanced action mechanism on these drums are strong enough to handle real calf heads, for timpanists who crave the richness and focus that synthetic heads have a tough time reproducing.